This article dwells on objects management and communication between the UNIGINE scripts, external C++ classes and C++ part of UNIGINE Engine (internal C++ classes and UnigineEditor). UNIGINE has its own optimized memory allocator for faster and more efficient memory management. It works within a particular preallocated memory pool, which is shared by all of the UNIGINE modules. Custom C++ modules, which extend UNIGINE functionality with external C++ classes, use an underlying system-provided allocator, which has a separate memory pool. Allocating memory, keeping track of those allocations and freeing memory blocks when they are no longer needed is mainly the task of managing objects. UNIGINE consists of several modules (including C++ modules mentioned above) each of which can establish the ownership of an object, meaning that it would be responsible for deallocating the memory when the object is no longer needed. By that, the object is accessible by all these modules. Ownership can also be released and transferred for another module to take responsibility and delete the unnecessary object at the right time. If failing to set only one owner that deallocates the object, memory leaks or even application crashes are imminent. Here, objects are instances of internal C++ classes. The following scheme shows UNIGINE ownership system by the example of Node. The Engine Editor block is marked with * in order to show that at the current moment this module owns the node (the instance of the internal C++ class). Note that this scheme is done as an example, and any of the modules can become an owner of the internal instance and store a pointer to it. World script that contains world logic. Editor script that wraps editor functionality and editor GUI. System script that does system housekeeping and controls the system menu GUI. Scripts are written in the UnigineScript language and allow creating user classes. An internal instance can be handled by any of the scripts (world, system or editor one), no matter whom it belongs to. The ownership matters when deleting it. Engine Editor. It is a C++ part of UNIGINE Engine. When the world is initialized, Engine Editor loads nodes from the world file and creates an array of pointers to their internal instances. Engine Editor nodes also appear in the World Hierarchy window as hierarchical list and can be adjusted in the virtual world in real-time. By default, Engine Editor owns all these nodes. Also ownership of a node can be transferred to Engine Editor from one of the scripts or from a C++ module. These instances are created on the C++ side of the user application via the create() function. Ownership of such instances is set manually via the grab() function of API C++ classes. To release ownership, the release() function is used. As instances of C++ API classes only store pointers to instances of internal C++ classes, they cannot be created and deleted via the standard new / delete operators. So they should be declared assmart pointers (Unigine::Ptr) that allow you to automatically manage their lifetime. If you delete a smart pointer, the instance of an API C++ class will be automatically deleted. In addition, this instance will delete the internal C++ object if the corresponding ownership is set via the grab() function. There is also Engine World, which is also a C++ part of UNIGINE Engine (do not confuse with the world script!). All the instances created via the new operator or the create() function are automatically added to Engine World. Engine World is responsible for loading a world with all its nodes, for managing a spatial tree and handling collisions and intersections of nodes. However, it doesn't take ownership of internal instances. If you create an instance on the script side of the application via the new operator, the script will become the owner and you will be able to delete the instance by using thedelete operator. If you create an instance on the C++ side via the create() function, the C++ module will take ownership of the instance and you will be able to delete it via the destroy() function. One instance of an internal C++ class should be owned only by one module to avoid double-freeing. When transferring ownership of an instance, it must be released from the previous owner and assigned to a new one. The order of these operations is of no importance. Never leave orphan or released instances without an assigned owner. All clone() functions in the library return new cloned instances that are not owned by any of the modules. engine.world.loadNode() loads an orphan node. Ownership is automatically reassigned in the following cases. That is why it is required to use class_remove() for created bodies, shapes or joints to release the script ownership. call class_remove(body) so that only the object will manage this body. call class_remove(shape) so that only the body will manage this shape. call class_remove(joint) so that only the body will manage this joint. However, if you assign a body to an object and call class_remove() for this body (as described above), such body will be owned by the object. So, when deleting the object, the body will be deleted too. The same goes for bodies and shapes and for bodies and joints. Here, clone() returns a new node, which is orphaned. To prevent the memory leak, a script takes ownership and safely deletes it. class_manage() indicates that reference counting should be performed for the internal instance. When the number of references that point to the instance reaches 0, the memory previously allocated for it is automatically deleted, thus freeing the developer from carefully managing the lifetime of pointed-to instances. Before calling this function, the internal instance should be appended to the script. Here, the image is automatically owned by the script, because it was created using a new operator. It will be deleted, because there are no references left to it. class_release() removes all references to the instance of the internal C++ class. It removes even the smallest memory leaks. class_remove() releases the ownership of the instance. It needs to be reassigned to any module (before or after it has been released) not to become orphaned. For example, it can be passed the Engine Editor to appear in the World Hierarchy window to be adjusted in real-time. class_cast() converts the pointer to an internal instance of a given type into another type. When converting into the other type a new internal instance isn't constructed, so you cannot delete it via the delete operator. If you try to delete the mesh declared in the example above via the delete operator, you will get an error. However, it you delete the node, the mesh will also be deleted. There is also a group of functions that allow you to safely handle hierarchical nodes together with all of their children. They can be found in thedata/core/unigine.h file of UNIGINE SDK. Node node_append(Node node) registers script ownership of the given node and its children. Here, the script takes ownership of both my node and its child node (NodeDummy). The situation presented in the example is created intentionally in order to show that node_append() sets script ownership for the whole node hierarchy. So, for example, you don't need to call class_remove() before adding a child to a node in your application. Node node_remove(Node node) releases script ownership of the given node and its children and casts them to their types. This function should be used, for example, to set Engine Editor ownership of the node owned by the script. Do not forget to set another owner for an orphan node (if any). void node_delete(Node node) deletes the parent node together with its children. Before calling this function, the node should be appended for the script to take ownership. Here, both the node and its child will be deleted. The situation presented in the example is created intentionally in order to show that node_delete() deletes the whole node hierarchy. So, for example, you don't need to call class_remove() before adding a child to a node in your application. Node node_clone(Node node) clones the node. Herewith, a new instance of the internal C++ class is created. Like for all otherclone() functions, the created instance is orphaned and its ownership is to be passed to some module. For example, this function is useful when the node is an object with a body and joints. A usual clone() function does not recreate connected joints. Here, the first mesh object is automatically owned by the script as it is created using new operator, while the copied one should be appended manually. Node node_cast(Node node) allows you to safely convert the given base node to its derived type. After downcasting, the node can call member functions of the ObjectMeshStatic class. If you try to delete the mesh declared in the example above via the delete operator, you will get an error as there is no such internal instance. However, if you delete the node, the mesh will also be deleted. One of the engine.world.call() to call functions of the world script. One of the engine.system.call() to call functions of the system script. One of the engine.editor.call() to call functions of the editor script. Create an instance in the world script and release world script ownership of this object, so that the system script can grab its ownership. Then pass the object to the system script function via the engine.system.call() function. In the system script function, set the system script ownership for the received orphan instance. Now this instance can be deleted using the delete operator; otherwise, the instance will be automatically deleted on the system script shut down. As it was said, Engine Editor owns the nodes loaded from the world file. When the world is unloaded, the nodes will be automatically deleted, thus freeing allocated memory. 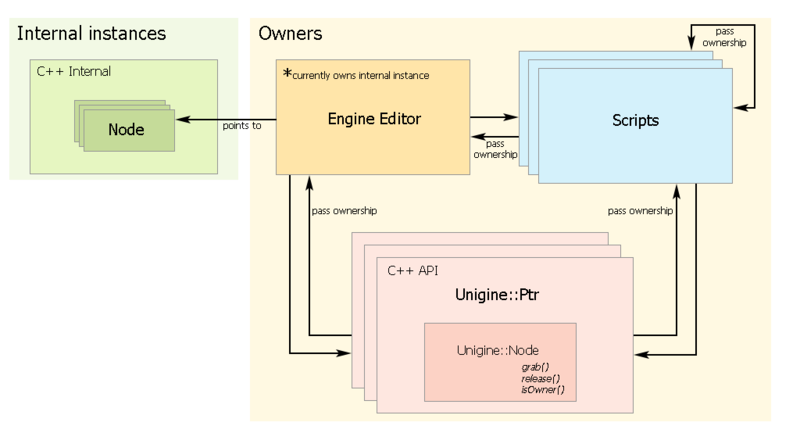 engine.editor.addNode() establishes Engine Editor ownership of the node. Before that, the instance should be released of other owners. engine.editor.removeNode() deletes the node that is owned by the Engine Editor. Here, a new mesh, which is created via the new operator and owned by the script, is released of script ownership. After that, it becomes orphaned and ownership is transfered to the Engine Editor, which safely deletes it. engine.editor.releaseNode() allows releasing ownership of the node held by the Engine Editor and transfer it to some other module (for example, the script). Here, ownership of the node is passed from the script to the Engine Editor, which in turn releases it. After that, the node is free to be owned by the script again. The first option is the following: a node that is created and handled by the world script is passed to the C++ function that receives a smart pointer. Create a custom function on the C++ side, which will receive a NodePtr smart pointer. Then a function needs to be registered with the UNIGINE interpreter, so that the script could call it in its runtime. Create a node in the world script and call the registered C++ function. The ownership of the node will belong to the script, so only it could call the delete operator to destroy the node. In this case, a node is passed to the C++ function that receives it as a smart pointer and this function grabs ownership of the node, so that it becomes responsible for its deleting. Create a custom function on the C++ side, which will receive a NodePtr smart pointer and grab its ownership. Then a function needs to be registered with UNIGINE interpreter, so that the script could call it in its runtime. Create a node in the world script, release script ownership and call the registered C++ function. The ownership of the node will belong to the external function, so you don't need to call delete operator to destroy the node. Script ownership must be released either on the script or C++ side. Otherwise, there will be 2 owners of the node and it will cause engine crash. This variant is similar to the first one: a node that is created and handled by the world script is passed to a C++ function that receives it as a smart pointer of a specific type. Here, "specific type" means a C++ API class that is wrapped with a smart pointer (for example, ObjectMeshStaticPtr, DecalDefferedMeshPtr and so on). Create a custom function on the C++ side, which will receive an ObjectMeshDynamicPtr smart pointer. The external function should be registered to be called by the script. On the script side, create an object and pass it to the external function. After that, the registered external C++ function call receive it, when called by the script. Ownership remains by the script, so it can delete the object. The third variant is to create an internal instance in the script (for example, the image) and pass it to the C++ function that receives a variable. The external function is called by the script thereafter. Create a custom function on the C++ side, which will receive a variable. The variable is cast to the ImagePtr smart pointer type using the dedicated function getImage(). After that, the C++ function should be registered to be called by the script. You should set the script runtime when calling the getImage() function: pass the pointer to the current interpreter via the Unigine::Interpreter::get() function. On the script side, the image needs to be created and simply passed to the C++ function. The image will be converted into the ImagePtr smart pointer automatically. Smart pointers allow the C++ function not only to receive instances of internal C++ classes created by the script, but also create such instances. You cannot create and pass an instance of a C++ API class as a smart pointer, as instances of C++ API classes cannot be created or deleted via the standard new and delete operators: such instances must be declared using smart pointers only. Here, a script calls an external function that creates a new image using ImagePtr. In the external C++ function, declare ImagePtr, call API function create() and pass the pointer to the script. However, if you just pass the pointer, it will be dangling, i.e. it will not point to the valid image object as it isn't visible outside the external function scope. To avoid it, you should pass ownership of the pointer to the script via therelease() function. Then a custom function is registered to be called on the script side. Call the registered C++ function. The image it returns can be simply passed to the script, as conversion from the ImagePtr into the Image will be done automatically. As ownership of the image has been passed from the external function to the script, it can be deleted by the script any time (or it will be automatically deleted on engine shut down). In this variant, the external function creates a new image as a variable and then the script calls this external function. In the C++ function, declare an ImagePtr, call the API function create() to create a smart pointer, which will allocate an internal UNIGINE image, and set it to the variable using the dedicated functionsetImage(). You should set the script runtime when calling the setImage() function: pass the pointer to the current interpreter via the Unigine::Interpreter::get() function. Only core classes (like Node, Object, etc.) instances can be converted to variables via TypeToVariable. In other cases, you need to cast a class instance to the core class first. A script calls the registered C++ function. After that, it handles the returned variable as a simple image, because conversion is done automatically. Remember, the script cannot delete the image, as the ownership belongs to the external function. The smart pointer will be automatically released when the reference count reaches zero. Unigine::Engine::getWorldInterpreter() to manage world script ownership of the pointer. Unigine::Engine::getSystemInterpreter() to manage system script ownership of the pointer. Unigine::Engine::getEditorInterpreter() to manage editor script ownership of the pointer. Setting the context is required as we perform conversion between external class variables and script ones. When calling the functions listed above, the corresponding script should already be loaded. Otherwise, NULL will be returned. Create a custom function on the C++ side, which will receive a variable. Release script ownership of the received variable. On the script side, create an image and pass it to the external C++ function. As the script ownership is released in the external function, there is no need to delete the image here.